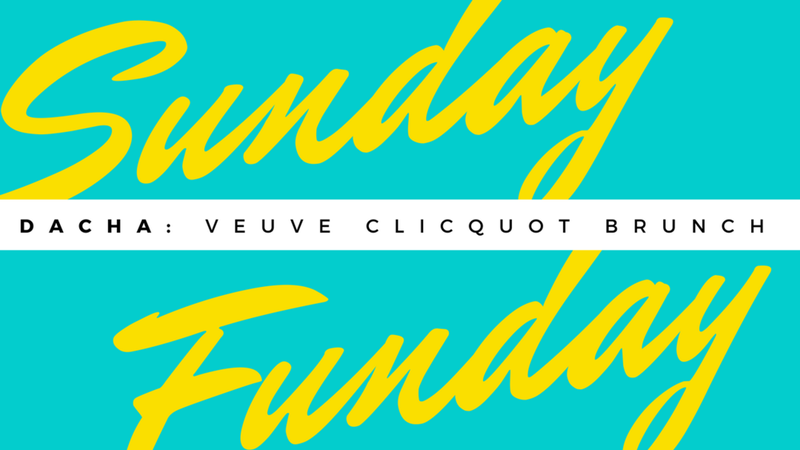 $15 Bottomless Mimosas and....*drum roll please*.....alcohol infused soft serve! $22 Bottomless Mimosas & Bellinis, $9 for "The Ultimate Bloody Mary Bar." All entrees $9.95 -- Try the "Everything Bagel Spice" Pizza or the "Best Bacon Ever." $39 Includes an endless selection of small plates and brunch drinks which include Bloody Marys, Mango Mimosas, Cherry Mimosas, Traditional Mimosas, and Peach & Lavender Mimosas. Try the Ambar Mimosa, potato hash, and steak & egg. $25 for Bottomless Mimosas & Bellinis with purchase of an entrée. Try the pork belly breakfast sandwich, breakfast burrito, or 'The Classic Hangover' breakfast platter. $20 Bottomless Mimosas or $35 for the 'Build-A-Bubble Workshop' (bottle of sparkling wine, fruit puree, cranberry, orange juice, grapefruit juice for the table.) Try the stuffed french toast or breakfast sammie. $39 Family style brunch tapas, sangria, and sweets on Saturdays and Sundays. Try the Nutella stuffed churros, patatas bravas, beef and potato croquettes with salsa brava & garlic aioli, and the bombas de la barceloneta. $20 base, add PAMA liquor, fresh orange, grapefruit, or lemon juice for + $1. Try The Full Irish or the (Georgia) Khachupuri. $20 for bottomless mimosas or $25 for Bottomless Bloodys . Try the House made Lamb Sausage, Homemade Cherry Wood Smoked Bacon, or Old Bay Fried Chicken. $16 for the DH Brunch Punch (Dealer's choice) and mimosas. Try the Elvis French Toast or Brunch Burrito. $20 Bottomless mimosas at Mike Isabella's Mediterranean restaurant. Try the chicken and waffles or baklava french toast. $20 gets you a cider porrón (big fancy glass jug) filled with lager and lemon soda or Port City Optimal Wit, Aperol and cider. Try the croquettes, patatas bravas, and french toast. $14 Bottomless Bloody Marys & Mimosas. $20 Bottomless mimosas and Michiladas. The brunch menu only has 4 options - all being breakfast burritos running $8 a pop. $35.99 for two hours of bottomless mimosas, bloodies, orange crushes and bud light, plus one shot of house-infused cinnamon whiskey. includes choice of any lunch or brunch entree and a pastry basket. 1/2 Price Mimosas or $20 Bottomless. Try the red velvet pancakes, blueberry pie french toast, or the "Family Meal." If you love pizza, you're in luck at this pizza-centric brunch. DIY pizza pie for $12 or try the Balthazar or Tessa breakfast pies. Mike Isabella's new Spanish/Moroccan restaurant inside the Marriott Marquis serves up brunch Saturdays & Sundays and features finger-licking good fare. Try the Bomba Rice, double fried potatoes, burnt eggplant, and gem lettuces. $12 Will get you choice of two brunch cocktails bottomless tea or coffee with brunch entree. The brunch menu at B&B and Churchkey is served all day on Sundays, not to mention the menu includes some of the best chicken and waffles in the country. A+ ambiance and brunch food right by the Georgetown waterfront. Try the brunch Bistro Burger, Croque Madame, and pastries. $29.99 Unlimited farm to table foodie brunch buffet. Try the sandwiches, pancakes, eggs, and roasted tomatoes. Sit outside when dining out during Hazel's "Dim Sunday." Try Grandma’s zucchini bread, the duck muffin, and brioche Bacon Rolls. Pay $95 for "The Whole Shebang!" and you'll get to try everything on this brunch menu. Great vibe, check. Outdoor seating, check. Lamb bacon, check. Best Bloody Mary in town? CHECK! CHECK! Head to Pennsylvania 6 for guaranteed good grubbin' downtown. The menu consists of all your favorite traditional brunch items including a savory plate of Home-Style Cooked Biscuits and Gravy, Crab Eggs Benedict, Eggs in Purgatory, and a Dutch Baby topped with whipped ricotta and fresh fruit. Thirsty? For just $18 (and the purchase of an entree) you can take advantage of our Unlimited Champagne & Bloody Mary Bar. You can also order $1 raw Chesapeake Oysters and $5 Chesapeake Oyster Shooters. Super chic brunch spot with a wide array of meaty brunch options and trendy vibe. Try the chicken and waffles or the fried chicken benedict. There's no bottomless booze deal here but for $27 you can indulge in the "Ultimate Pig Brunch" which includes One starter, One Entree or Sandwich, One Dessert OR Pig Bloody or Mimosa. Le Grenier // Best Bang For Your Brunch Buck In D.C.
Boundary Road // For The Best Baco...Ever? B Too // To Ruin Your Diet & Instagram The Infamous "Doffle"
Vinoteca // An Oldie But Goodie Brunch Favorite In D.C.
+ You're Looking For The Hub Of Deep House & Sometimes Trancey-ish Music In Washington D.C.